Copyright © 1997 Balmoral Software (http://www.balmoralsoftware.com). Portions copyright © 1997 DreamCatcher Interctive, Inc. All rights reserved. Republication, redistribution or conversion is expressly prohibited without the prior written consent of Balmoral Software. Contents subject to change! For the latest information, see http://www.balmoralsoftware.com. Beyond Time is not a bad game, really, just one that repeats many of the themes and ideas presented in title after title of the adventure-game genre. If you enjoy games with less than the latest high-definition graphics, a few puzzles and a contrived and derivative plot, then Beyond Time will probably fit the bill. The game interface is well thought-out, with a menu of game control choices and online help just a mouse click away. A "smart" cursor is quite intuitive and easy to use. Convenient keyboard shortcuts are available for some functions (such as "I" to show/hide the inventory bar). Of course, it would have been nice to also have keyboard arrow keys for movement (as in Timelapse ). A nice touch is the inclusion of replay buttons to repeat FMV segments at various points in the game. Saved-game slots allow for long descriptions and are unlimited in number, although not file-based. The game has an annoying requirement to always start from CD-ROM #1, but this may be less onerous than in other games since Beyond Time comes on just two discs. Beyond Time's graphics are weak at best, presented in a small gameplay viewport. Transitions between scenes are made in a slideshow format, without even the minimal animations found, for example, in older Director-based games. Clearly, some backgrounds could have benefited from a higher level of detail; e.g., the slab-like beds and pillows in the Labyrinth living quarters. Graphics generally seem a lot like 1995's Majestic (maybe a little bit better), but are based on the same kind of low-detail rendering. A few animal sprites are encountered, principally in the Dark Way, giving the game the flavor of a poor man's Timelapse. The FMV acting in the game is soporific, especially difficult to endure in the myriad technobabbling video journal entries in the Labyrinth - simply way overdone. In these scenes, characters are always dressed exactly the same, even though the journal entries are supposed to cover a period of months. The choice of names for the "Travelers" seemed strange - Temogen sounds a lot like Temujin, Lantis a lot like Atlantis, etc. For any sort of replayability, a method to skip video segments is sorely lacking. Probably the best thing about Beyond Time is its puzzles, sprinkled liberally throughout the game, but not particularly well-integrated into the overall plot. Especially in the earlier parts of the game, there seems to be a good degree of nonlinearity in gameplay, so various sequences of puzzles or artifact hunts can be worked on simultaneously. A few puzzles are reasonably complex, with the occasional red herring or bit of misdirection. However, our overall impression is that more and better puzzles would have improved the game - most puzzles will be quite easy for the reasonably-observant player. 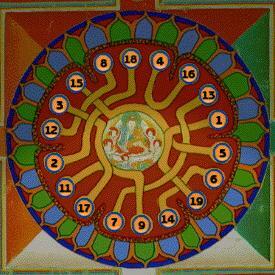 A notable example of a puzzle needing improvement is the Mandala Puzzle encountered late in the game - this particular puzzle has 114 legitimate solutions, but the game designers chose to accept only one of them! Beyond Time is marketed by the same company that has reissued Jewels of the Oracle (and a reference to JOTO is made on its packaging), but its puzzles have a long way to go before they're in the same league. If you're looking for a good puzzle game along the lines of Jewels of the Oracle, you'd be better off with Karma: Curse of the 12 Caves (if you can find it), which was published by the same company that produced Jewels of the Oracle. Most of the music in Beyond Time is pretty good, but occasionally sounds somewhat like a TV movie. In the Labyrinth, the music is very reminiscent of the movies The Shining and John Carpenter's The Thing. Sound effects throughout the game are minimal, but by the same token, non-intrusive. The thunder and lightning at Tikal is a nice touch. Beyond Time was developed by Jones Multimedia. Could the Doctors Jones be a little insecure about their level of advanced education? No less than 33 references to their titles appear in the game credits. We get the point, O Great Ones. Beyond Time has a few bugs, but none that couldn't be worked around. DreamCatcher Interactive's toll-free technical support was helpful in acknowledging these problems and apparently plan on issuing a game patch in the near future. In particular, try to avoid operating the top of the obelisk in the west bank courtyard until absolutely necessary - several players have had lockups at this point, especially after viewing a video segment of the Fire God. We also had many "opltimer" error messages on the raised platforms of the space station's observation deck, but these could be ignored without crashing the game. Overall, Beyond Time is a diverting adventure game experience, but won't go down in history as a classic. As a puzzle game, it can't compare to older and better titles. As an adventure game, it is overshadowed by many of the titles released in the last couple of years. Click the mouse to skip the game introduction. If you wait and enter no selection at the main menu, you'll get a long introductory video sequence about missing historical artifacts worldwide. Most puzzles reset to their original initial state if you zoom out from them. 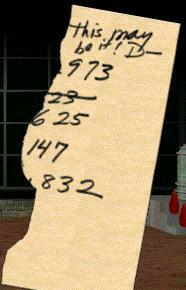 For additional strategic clues, refer to the booklet that came with the game. Not all areas are explored in this walkthrough, just the ones required to complete the game. There are a few animated sprites sprinkled around the game. Arriving in present-day Egypt, move T F3 L to face the statue of Osiris, then get transported back in time to Abydos in the ancient past. Move F L and listen to the Priestess instruct you to restore a stolen scarab amulet to the statue of Horus (see the Court of Horus map). 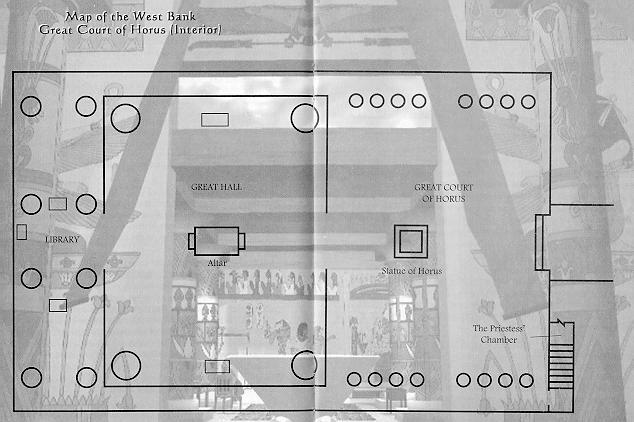 Move F2 and open the door to the Great Court of Horus. Move F4 L F R2 D and pick up the amulet lying on the ground behind and to the side of the Horus (falcon) statue. Move U L2 F L F L2 and return the amulet to the breast of the falcon. Close the scroll. If desired, wander around the Library and Court examining other scrolls and scroll fragments (all inexplicably written in English) for more of the game's backstory. Otherwise, move R RF F6 R F4 L F U2 RF F3 into the Priestess' Chamber. 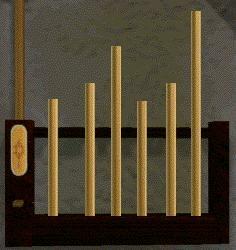 If you want to play the optional Organ Puzzle later in the game, remove the Air Key from a panel in the wall. 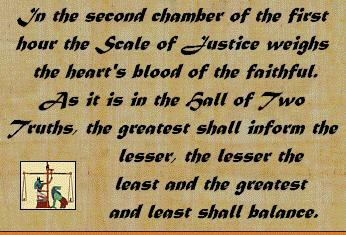 Move D and examine the Betrayal of Osiris scroll at the top of the table. Here you'll learn that there were 74 betrayers of Osiris (Set, Aso and 72 others) and that Set cut the body of Osiris into 14 pieces. Examine the scroll at left to learn that each of the two-headed Serpents of Sakkara is the equal of the others, and that they form a triangle with equal sides. Close the scroll, move U T F R and zoom in on the Snake Puzzle. However, the game only accepts the left-hand solution above. When you've completed the puzzle, pick up the golden Eye of Osiris from the drawer that has opened. Move U L F2 RF RF F2 R and open the doors. Move F2 L and zoom in on the reflecting pool outside the Court of Horus. Pick up the Water Key from the pool, then move U R F R F R LF F and zoom in on the earthen pot flanking the pathway. Pick up the Earth Key and move U L LF F R F to the Osiris statue in the courtyard. Verify that you have at least the Water, Fire and Earth Keys in your inventory (check the online help for hieroglyph details), then insert the Eye of Osiris into the base of the statue and move D F5 LF into the Dark Way. Insert the Water Key into the pedestal, move F5 into the Water Tunnel and pick up the bucket of water in the passageway. Further progress in this tunnel is blocked by a crocodile-infested moat, so move T F4 RF back to the pedestal and insert the Fire Key. Move F5 into the Fire Tunnel and pick up a torch from the holder on the wall. Move F and douse the sheet of flames using the bucket of water in your inventory. Continue F5 to the Fire Obelisk and click on its top to orient the ankh symbol to the east. Check the online help for direction hieroglyphs. The proper orientation is most easily accomplished by aligning the ankh with the two-bar West symbol you're facing, then clicking the top of the obelisk twice. Move T D F9 RF back to the pedestal and insert the Earth Key. Move F4 into the Earth Tunnel and pick up a bucket of sand in front of a closed stone door. Use the torch to burn through the rope connecting the two halves of the wooden rod, opening the door. Move RF F LF F2 RF and repeat the ankh orientation procedure. Move F RF F2 LF LF F2 and press the water symbol on the pedestal. Move F5 into the Water Tunnel and put the bucket of sand into the receptacle at right, raising the drawbridge. Move F2 to the obelisk and orient the ankh. Move T T F6 LF back to the pedestal. When the puzzle is solved, you'll hear a tone and the gate raising behind you. Move T LF F5 RF RF back to the pedestal. 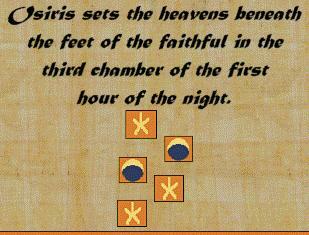 Move F into the chamber and listen to Isis pose a question that must be answered in order to pass through the "First Gate" that you'll encounter later in the game. Pick up a golden jackal that she leaves for you. Move T F T and again zoom in on the door lock. and note that sometimes Isis will not appear in her chamber unless you turn to the left after entering. Pick up a golden ankh (key), falcon and urn. When you've safely brought all three offerings to the east bank, they're returned to your inventory. Move L F L F5 and open the doors into the Labyrinth. After a CD-ROM change, move F to the golden statue and place all three offerings at the indicated positions on the platform at the statue base. Move F2 and open the doors. 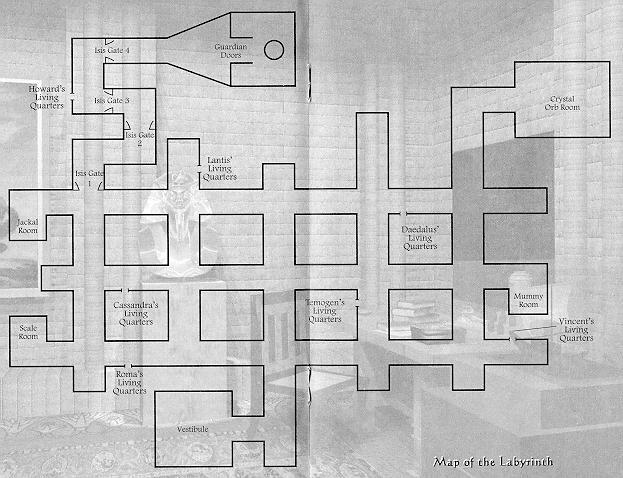 Most of the living quarters in the Labyrinth (see map) contain numerous obscure video journal entries describing the team's work on a time machine, their use of it to pilfer historical artifacts, and their eventual failure due to unexplained forces. We'll skip these non-critical details in this walkthrough and will only visit living quarters when necessary, instead concentrating on the puzzles found elsewhere in the Labyrinth. Pass through the doors and move L LF F4 R.
This indicates that the medium container is exactly twice the capacity of the small one, and the large container is (at least) three times the capacity of the small one. With capacities in the ratio 9:6:3, it is impossible to divide 9 units of liquid into two equal portions. 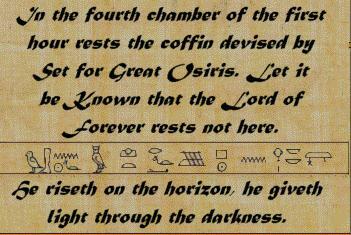 Move L F2 LF F8 LF RF R and open the doors to Osiris' Mummy Room. 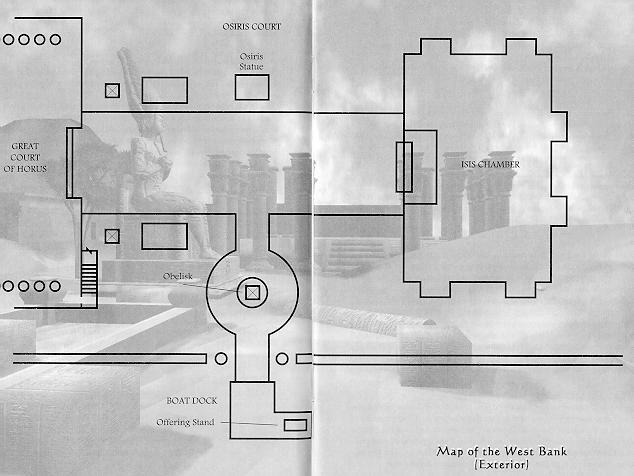 Zoom out from the obelisk, move T F3 LF RF F RF and open the doors to the Crystal Orb Room. Move T F8 LF RF L and click on the yellow button to open the door to Daedelus' living quarters. Zoom out from the note, move R F LF RF F2 LF and open the door to the Jackal Room. Zoom out from the cube and move T F RF LF to the first of four Isis gates. 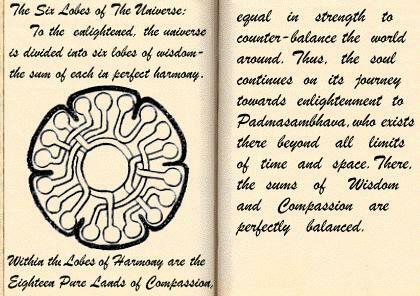 Open the fourth gate and pass through it. Open the Guardian Doors by using the ankh key from your inventory, then move F. After a CD-ROM change back to disc #1, move F T into the elevator and click on the fuzzy red/green control panel to go up to the main Gate control room. Move F2 L and click on the model of Earth at the extreme right. Press the red button to activate all Gate destinations on Earth. Move R and click on the gate control console at left. Move F D and press the red button to activate an image of Earth in the viewfinder. Click on the triangle of the viewfinder five times to display Lhasa at left. Click on the green button to access the coordinates screen. Enter the Lhasa coordinates found earlier (85:80:40). When the puzzle has been completed, a broken key at the bottom of the puzzle is reformed and transferred to your inventory. Move L F RF F2 R F5 RF F LF F RF F2 past the Monks' Room and open the main entrance doors. Click on the Gate to return to the Abydos control room. Move D and select Tikal as your destination. Enter the Tikal coordinates found earlier (64:90:20). The solution of this puzzle opens doors at the top of the tall pyramid. Move F5 and pick up a power crystal from the circular platform. Move T F6 R F3 R F2 L F3 D F6 through the Ball Court and down to a subterranean chamber in another building. Use the key from Lhasa to unlock the doors. Open the doors, pass through the doorway and move F6 L F into the Sarcophagus Chamber. Click twice on the wall panel to disclose a green crystal. Move R and click twice on another wall panel to disclose an orange crystal. Move R RF and click twice on a third wall panel to disclose a purple crystal. Move R and click twice on a fourth wall panel to disclose a red crystal. When all four crystals have been revealed, you'll hear the sound of another stone panel opening. Move R LF F R to see a previously-hidden skull. Rotate the skull and click on the pedestal that you find yourself facing, opening the sarcophagus. Move F2 and wrest a power crystal from the bony fingers of the skeleton. The large door at the back of the Sarcophagus Room is for registered guests only. Move U2 T F14 L F R F4 R F2 R2, then click F2 between the cylindrical columns of the Gate to return to the Abydos control room. Move D and select Atlantis as your destination. Enter the Atlantis coordinates found earlier (19:60:30). In Atlantis, all surface paths lead to the same destination. From the gate, move F13 L and press the elevator "down" button to board a submarine. As in many other adventure games (Amber, Lighthouse and Riven , to name a few), your task is to slowly and laboriously negotiate an underwater maze with your vehicle. Use the crystals at the center of the control panel to reorient or move the vehicle. The maze's junctions do not necessarily form pathways at right angles, so it's important to note the appearance of the seascape through the porthole in various directions to avoid getting lost. A row of clue crystals at the top of the control panel indicates proximity to your goal. Move F3 R F R F L F L F and use the T-shaped claw control to pick up the power crystal. Return to the dock by using the bottom control-panel button to turn the submarine around, then moving F2 R F L F L F3 and turning the submarine around again. Move U L F14 to return through the Gate to the Abydos control room. You won't have enough power in the Gate to access your next destination, so the first order of business is to utilize the power crystals you've been collecting. Move T F3 T into the elevator and use the thumb of the open-hand cursor to click on the top (red) button of the elevator control panel. Move F L and click on the empty power-crystal receptacle. Insert one of the power crystals from your inventory. Move L2 and repeat the procedure for the next empty receptacle. Move L2 and perform the procedure again for a third empty power-crystal receptacle. Move L2 F L F L2 F T back into the elevator, noting that there is one empty power-crystal receptacle remaining. Click on the green button of the elevator control panel to return to the Gate control room. Move F2 R2 and click on the model of a white planet. Press the red button to activate Traveler 1 destinations. Move L F and click on the gate control console at the extreme right. Move F D and press the red and green buttons. Enter the Space Station coordinates found earlier (14:25:50). Move F and pass through the door into the docking bay. Move L F L and pass through the door into the elevator. Click on the control panel at left and select Floor 2. Move F2 LF F11 and click on the pyramid to disclose an access code (167) that will be needed later. Move R2 F11 and pick up a tan-colored elevator access card at right. Move T F3 L and re-enter the elevator. Click on the control panel and insert the access card into the slot. Select Floor 3. Move F L F2 L F3 RF U2 R F to access the stateroom control panel on one of the raised platforms surrounding a tree. Click on the panel and press the red button to activate it. Enter the code number (167) you found on Floor 2, and access to Howard's stateroom will be granted. Zoom out from the control panel and move R F2 D F2 R F R F4 L F into Howard's stateroom. Click on the chest and open it using the key in your inventory, obtaining the last power crystal. If desired, wander around the stateroom discovering the various famous objets d'art it contains, as well as a non-functional door to the left of the entry hatch. From a position facing the chest that held the crystal, move L and zoom in on the pentagonal access hatch. Move F6 R2 F4 R and re-enter the elevator. Select Floor 1, move F R F R and pass through the door into the Gate room. Move F2 through the Gate. Rotate L to enter these codes for each of four crystals. A tone will sound when you've entered the code correctly. After the poor-sounding, silly endgame sequence, you're returned to present-day Abydos and the game credits roll.